Newport Beach City Council candidates (sitting, left to right) Diane Dixon, Mike Glenn, Marshall “Duffy” Duffield, Tim Stoaks, Roy Englebrecht, Kevin Muldoon, Joy Brenner, and Scott Peotter, answer a question about the Balboa Peninsula Trolley during a West Newport Beach Association forum on Wednesday at Marina Park on the Balboa Peninsula. 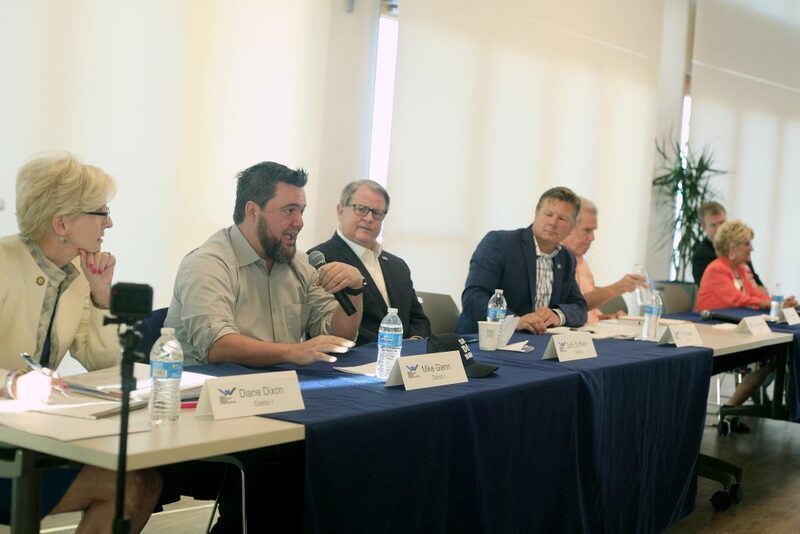 Newport Beach City Council candidates addressed some recent name-calling, rumors, and considered several topics specific to the Balboa Peninsula and West Newport at a forum this week. 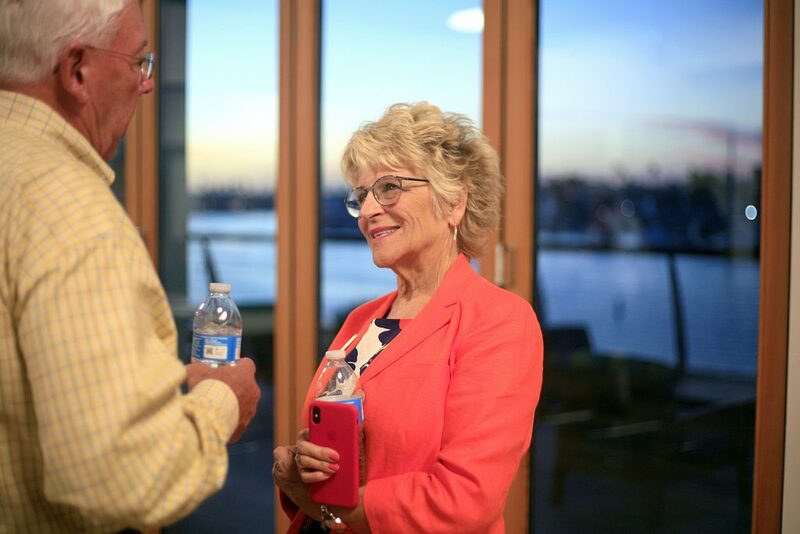 West Newport Beach Association hosted the second candidate forum of the campaign season Wednesday at Marina Park. WNBA President Craig Batley and Vice President Jim Miller moderated the event. All eight candidates attended (incumbents listed first): Diane Dixon and Mike Glenn, running for District 1; Marshall “Duffy” Duffield and Tim Stoaks, in District 3; Kevin Muldoon and Roy Englebrecht, in District 4; and Scott Peotter and Joy Brenner, in District 6. Glenn had to leave early for a previously scheduled commitment. Things got a bit contentious and personal during the portion of the forum that allowed candidates to asked each other questions. 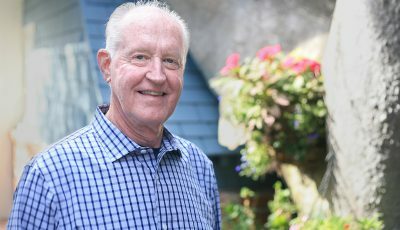 He asked the candidates associated with McCaffrey, who has contributed to some of the dubbed “Team Newport” candidates in the past, if they supported or denounced the statement. Muldoon said he doesn’t agree with that type of language or what was said. “I really try to be respectful and civil,” Muldoon said, which is important to maintain in a non-partisan race that involves neighbors, he added. Englebrecht added a follow-up question, asking if Peotter would still hold a fundraising event at McCaffrey’s home. Brenner also referenced the letter and asked Peotter if he would try to convince McCaffrey to not engage in that type of name calling in the future. In response, Peotter pointed out that he was not the person who said it. “I don’t think anybody tells Bob (McCaffrey) what to do,” Peotter added. Current Mayor and District 3 incumbent Marshall “Duffy” Duffield talks with residents after the forum on Wednesday. 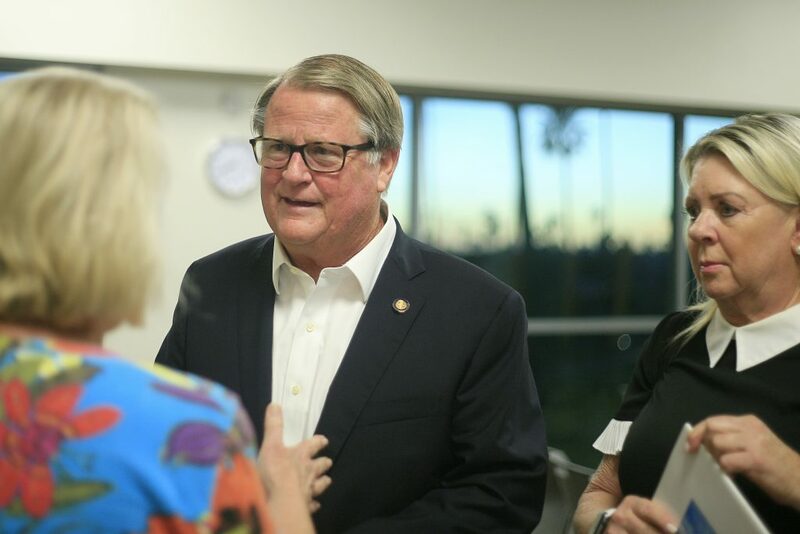 Dixon added that language is unacceptable and does not befit candidates in Newport Beach. In another candidate question, Stoaks asked his opponent, Duffield, if he ever employed Peotter while he was on City Council, a claim that has circulated on social media this past week. The claim is that if Duffield had, Peotter should recuse himself on the same issues, primarily harbor related topics, that Duffield does. “I don’t subscribe to this type of questioning,” Duffield responded. He doesn’t think it’s fair to put his fellow candidates “on the spot,” Duffield explained. He apologized and said he didn’t think it was an appropriate question for this type of forum. Other questions from Muldoon and Peotter were more light-hearted, asking about their opponent’s favorite part of campaigning or their grandchildren. During the rest of the forum, several questions focused on issues specific to West Newport. 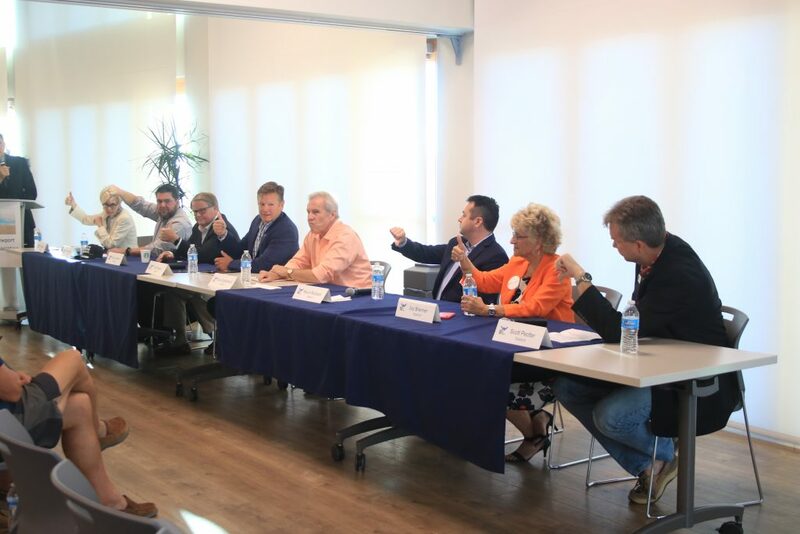 After a question about the biggest challenges facing West Newport, several candidates noted the uniqueness of the area. Balboa Peninsula is the jewel of Newport, Peotter said. 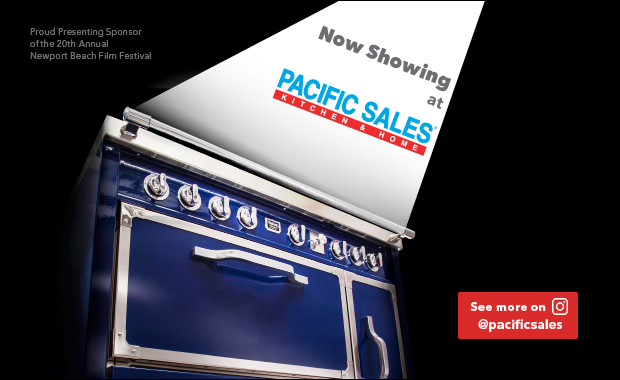 “All the things that happen on the peninsula, they’re just not anywhere else in our community,” Peotter said. There’s been focus on revitalizing the area recently, Dixon point out. “There’s more economic vitality going on on the Peninsula than in the last 40 years,” Dixon said, citing Lido House Hotel, Lido Village, Marina Park, and Balboa Village. Candidates were also asked about the possibility of a West Newport community center with a swimming pool, an idea that has been floating around for a few years. The potential project was discussed quite a bit in recent years, including selecting possible locations. It was tabled due to financial constraints. Dixon said she’d like to revisit the idea within the next four years. Duffield suggested a public-private partnership to fund the project, an idea that his opponent, Stoaks, and others also mentioned. This type of funding process was done with the Oasis Senior Center and it’s currently being used for an animal shelter, noted Stoaks, who worked on both efforts. “Investing in our community makes our community better,” and increases property values and helps the community thrive, Brenner said. It benefits everyone, she added. District 6 City Council candidate Joy Brenner talks with residents after the forum on Wednesday evening. Although not everyone agreed it was an endeavor worth pursuing. “We have a great swimming pool right behind us,” Englebrecht said, pointing to the beach and harbor by Marina Park. A community center is not revenue generating, Englebrecht noted. The city does not have a revenue problem, it has a spending problem, he added. “We simply can’t afford it,” Glenn said. Although it’s a nice idea, financing it is a problem, a few agreed. City debt and revenue were also a common talking point during the forum, with some concerns about the financial state of the city being raised, particularly by Glenn. Referencing the Balboa Theater, trolley service, and dog beach, and a few other projects, Glenn said they weren’t the right decisions. “These are solutions that are just absolutely inappropriate and they all happened in the last four years,” Glenn said. 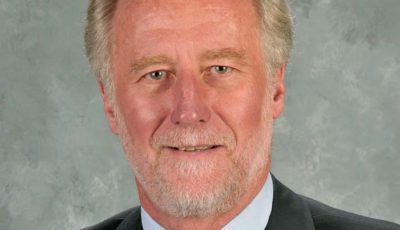 The city shouldn’t have a “fire sale” and sell off valuable property in order to pay down the debt, namely the unfunded pension liability, Brenner said. While it is a big issue, it’s being paid down and being managed wisely, she noted. A few candidates noted that the city has been following an aggressive plan to pay down the unfunded pension liability, which stands at about $321 million. “We are not falling off a cliff,” Dixon said. 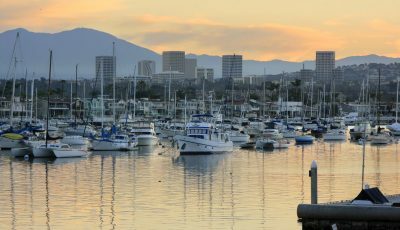 Candidates were also split on the idea of a restaurant or business at the end of Newport Pier. Peotter would love to see it happen. It’d be great to have a restaurant or business there, several others agreed. The challenge is the business would be very slow for half the year and the developer would need to invest a lot in renovating the space, several agreed. Also, getting employees in and trash out, Duffield added. The idea of a pre-fabricated building from Bluewater Grill, which the city has been working with, is a great idea, Duffield said. 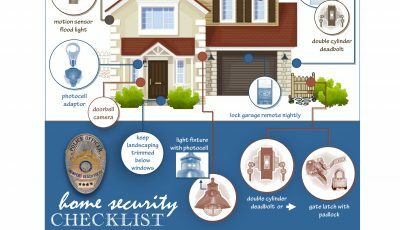 Residents have voiced support of something like this, Stoaks said. “It’s an investment in our community, for our community,” Stoaks said. But not all were on board with the idea. Roy Englebrecht, the challenger in in District 4, talks with residents Wednesday after the candidate forum. As a “big picture guy” Englebrecht said just a restaurant at the end of the pier “doesn’t make any sense.” It would need more to attract and keep people there year-round, he said. Something “Santa Monica-like” would be a better idea, he added. The Balboa Peninsula Trolley was another local topic discussed at the forum. The free service carries passengers to the Balboa Village, Marina Park, and Lido Village. During last year’s trial run, the trolleys carried a total of 23,560 passengers during the 26-day trial period, for an average of about 906 average daily riders. On July 4 alone, they counted 2,209 riders. Candidates were split on whether or not to keep the trolley service on the peninsula. Dixon, who spearheaded the project, along with Duffield, Stoaks, and Brenner, all supported continuing the service. Glenn, who has been an outspoken critic of the trolley, as well as Muldoon, and Peotter all gave a thumbs down to the idea. Englebrecht didn’t signal either way. It’s a “bus service that’s painted to look like a trolley,” Glenn said. It’s basically a “mobile air conditioning unit” for the homeless, he added. The trolley replaced the Downtowner, which was a private business that offered free rides on the peninsula, Glenn criticized. Another question focused on an important issue in West Newport: Motorized vehicles on the boardwalk. 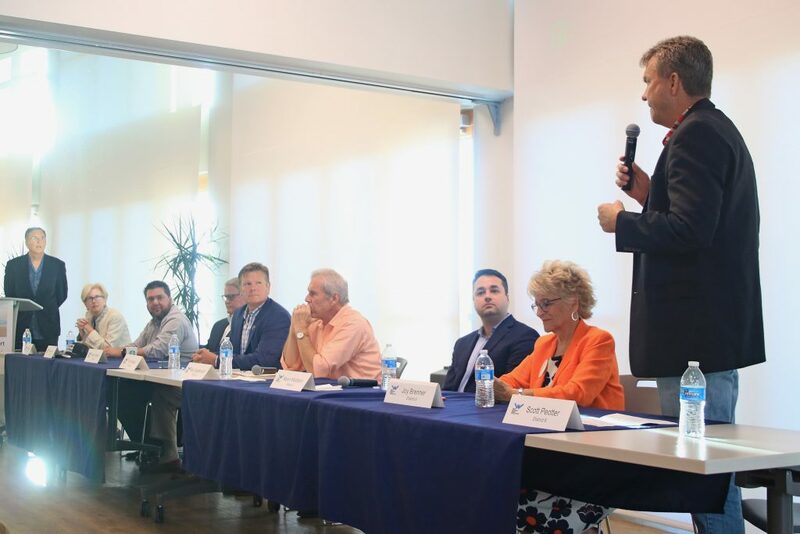 Candidates were asked if they agree or disagree with, what the moderators described as “most West Newport Beach residents,” that the city should prohibit all motorized vehicles, including electric scooters and skateboards, on the boardwalk. District 1 challenger Mike Glenn answers a question during the forum on Wednesday as his fellow candidates listen. All candidates gave a thumbs up except for Glenn, who gave a thumbs down on the issue, and Muldoon, who abstained because of a business conflict. 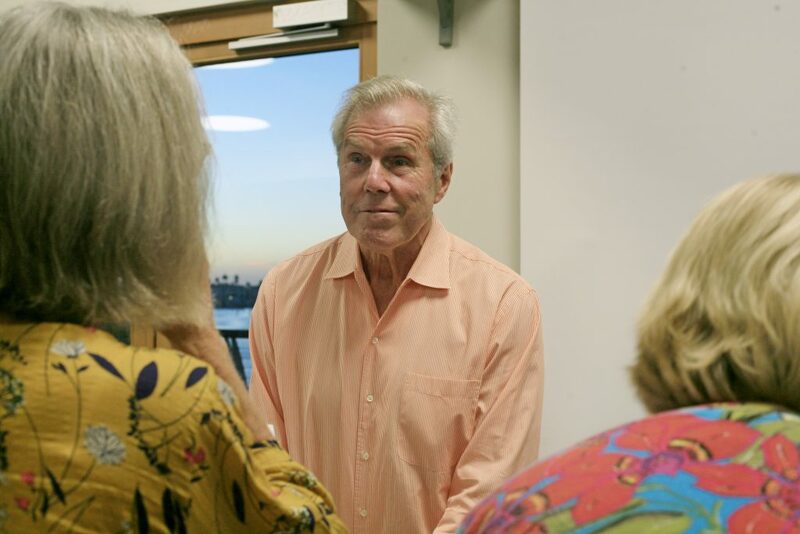 Glenn also criticized the previous Council, which included all four incumbents, for selling the Balboa Theater to a “friend” for less money than other proposals offered. The highest offer was for $1.7 million to tear down the building and develop a mixed-use project. Ultimately, Council unanimously approved sale of the historic theater to local developer Lab Holding, LLC, for $1 million, in 2016. LAB founder Shaheen Sadeghi said the vision is to preserve the historic building and bring it back to its original glory. At the time, then-Councilman Ed Selich expressed excitement for what the LAB has in store for the historical theater. Moderators also asked if the candidates agreed or disagreed with the city ordinance that dogs should be on leashes on the beach, including in the area known as the city’s de facto dog beach. There was some confusion over the question since the strip of sand at the mouth of the Santa Ana River is technically on county land, although most people who take their pups to the spot have to cross over city land to get there. The always popular topic of traffic was also discussed. The Balboa Peninsula sees a large portion of the swell of visitors during the summer, making the area unique regarding traffic. 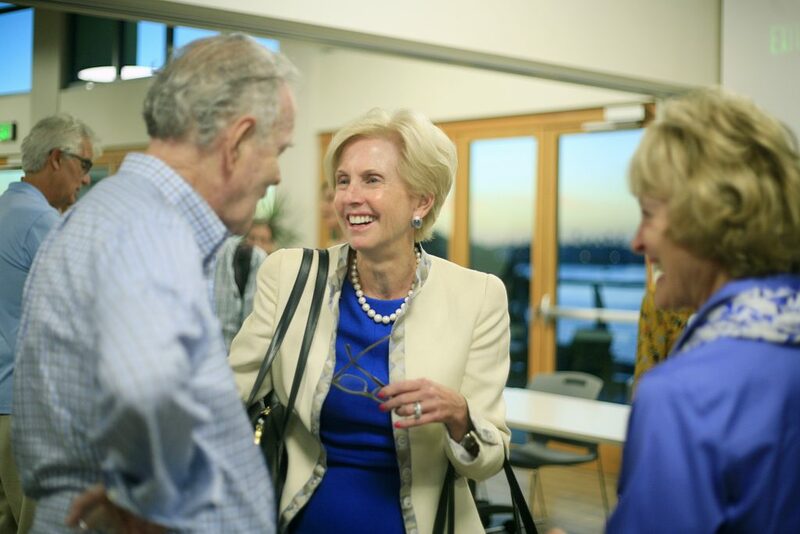 District 1 incumbent Councilwoman Diane Dixon talks with residents after the forum on Wednesday at Marina Park. There is the same amount of beachfront as there has always been, but considerably more visitors, Stoaks noted. The beaches are actually shrinking “tremendously,” Duffield commented. Replenishment needs to be an important issue to tackle, he added. Traffic goes “hand in hand with overdevelopment,” Brenner said. In order to get it under control, there needs to be an update to the General Plan that is approved by the residents, she noted. The challenge is encouraging businesses and visitors, like a Fashion Island “feel,” while addressing the problems that come with that, Englebrecht said. The forum included introductions, a round of “thumbs up” or “thumbs” down questions, several quick answers on a few issues, an opportunity for each candidate to ask another candidate a question, and concluding remarks. District 3 incumbent Scott Peotter talks during the West Newport Beach Association forum on Wednesday as his fellow candidates listen.